10 Designer Lehenga Stores in Mumbai which will NOT burn a hole in your pocket! One of the major expenses that a bride has to think about in her wedding planning is obviously her bridal lehenga collection! Well, shopping for a ‘designer’ wedding lehenga is actually a dream for every bride but you need to know the apt lehenga designer stores that would not cost you a bomb unlike those high-end designer stores! Tamanna is well known for their ornate silk collection which uses the richest of silks sourced from Banaras, Gujarat and South India. By always using pure fabrics, paying attention to fine quality, intricate stitching and embroidery details, Tamanna has created a niche for itself as a designer label. An affordable name in Mumbai that brings you customized wedding outfits in your budget. Their floral printed wedding lehengas as well as their brightly colored bridal lehengas with neat detailing and embroideries are a definite eyecatch. I simply adore their lehenga collection and recommend you to definitely visit their store! Their gorgeous collection of light-weight vibrant colored lehengas are perfect for a twirly sangeet night or happening mehendi ceremony. The store also features beautiful sarees in an affordable range. Saan.She is perfectly meant for those who do not like OTT embroideries and exorbitant detailing on their outfits. And since they are affordable, you can find many pretty outfits in vibrant colors for your functions without spending a bomb on them. The grace of their lehenga collection lies in its modern appeal and hint of vintage touch. If you are not looking for a bridal wedding lehenga then this might be the choice for a cool and offbeat Mehndi or sangeet trousseau. They have got sarees, different sort of lehengas and outfits with a contemporary touch to suit your style needs and preferences. 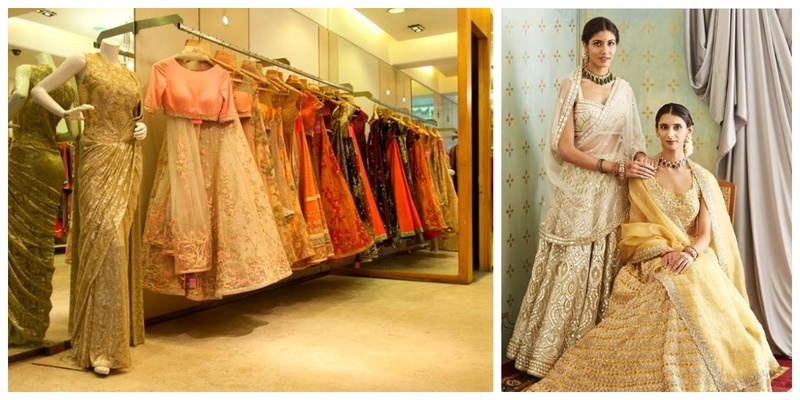 This lehenga store in South Mumbai is definitely a must-visit for every Mumbai bride! From mehndi collection to wedding wear, there is a treasure trove of clothing that you can choose from, for all your wedding occasions. They have an attractive line of bridal wear which includes mesmerising pretty pastels as well as stunning reds and pinks. Benzer is one of the oldest boutique store in Mumbai that acquires its elegance by coping up with the frequent changing trend. So if you are looking for a light and funky Mehndi lehenga or a gorgeous and heavy bridal wear, Benzer has got you covered. They even provide customised clothing as they have collaborated with quite a lot of designers. A store popular for selling ‘inspired pieces’ has become the favourite amongst the local mumbai girls. We spotted a real bride flaunting the collection from Sushma sarees and cant get over the amazing work on her lehenga. Rich colors, beautiful embroideries and intricate detailing is what that makes their lehenga collection stand a class apart. They are relatively new but understand the changing trends like a pro. My personal favourite is their gorgeous Indo-western collection. Classic Indian Bridal & Festive wear designed with a modern touch has been Ritu's Philosophy since the inception of her fashion house. Practicality elegance and effortless style is Ritu Seksaria's forte. Ritu, only meets by appointments though so you need to be prepared beforehand if you are planning to take a look at their gorgeous collection. It’s an absolutely amazing one-stop destination for bridal shopping. Its a 62 year old well-established brand that features two stores in Mumbai- one in Marine Lines and the other in Santacruz. Their wide range of trousseau collection features traditional Indian wear as well as trendy and offbeat Indowesterns. So ladies, make up your mind and kick up your heels cause its shopping time!